DownWithTyranny! 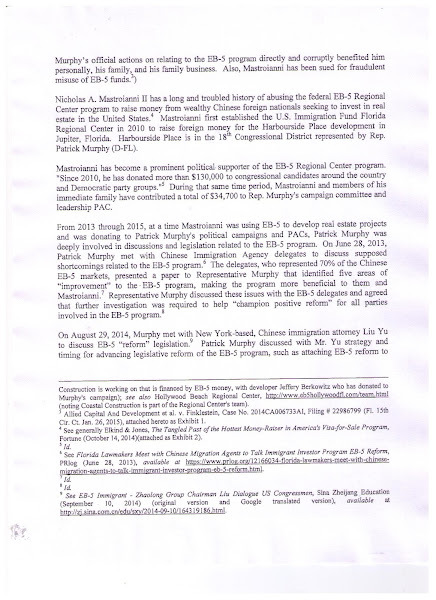 : What Is Patrick Murphy's Role In Selling EB-5 Visas To Chinese Nationals? 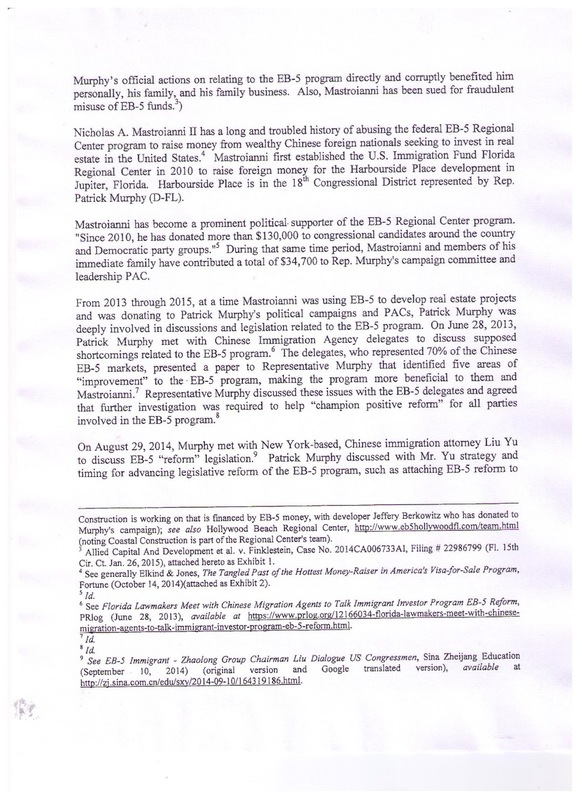 What Is Patrick Murphy's Role In Selling EB-5 Visas To Chinese Nationals? Patrick Murphy is a rich, spoiled Republican without a single legislative or professional accomplishment that he can honestly point to. The key word being honestly. He’s been outed recently for lying about his resume and background, and he got caught doing it again this week. As we've been warning readers for 3 years, he’s worse than a liar and Wall Street sellout. I believe Patrick Murphy and his corporate cronies are breaking campaign finance, bribery and ethics laws. 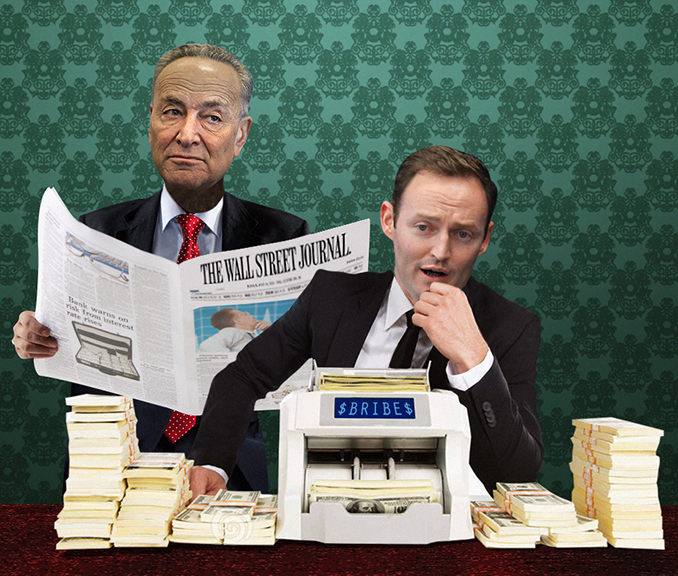 So this week I filed separate complaints with Department of Justice, the Office of Congressional Ethics and the Federal Elections Commission, calling for investigations into Murphy and his dirty donors. 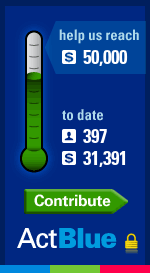 I started this blog with the express purpose of doing my part to make sure Duke Cunningham (R-CA) had his day in court. I'm proud that our work helped-- in whatever small way-- put him in prison. Let's keep our fingers crossed that the law catches up with the equally reprehensible Patrick Murphy and his cronies. 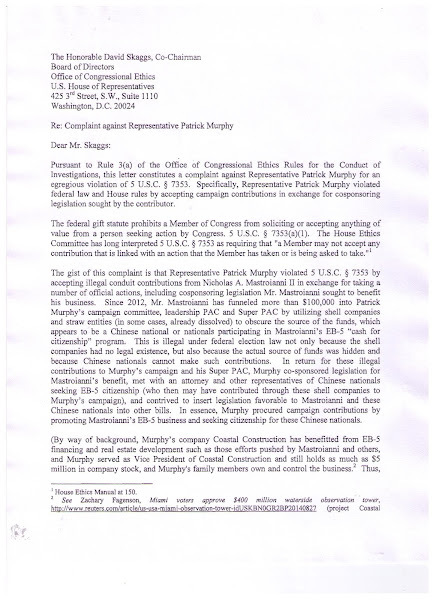 The complaints center upon the sleazy Nicholas Mastroianni II and EB-5 program Murphy has pushed in Congress. DWT has written quite a bit about this shady fundraising figure and his ties to Murphy and other corrupt corporate Democrats. Basically, I believe he’s orchestrated a scheme to funnel more than $100,000 into Murphy’s political campaign efforts by using shell companies and straw entities to hide the source of the money, which appears to be coming from Chinese nationals participating in Mastroianni’s EB-5 visa-for-sale program. Shell companies are already being broadly scrutinized for being possible illegal donor entities under the law. 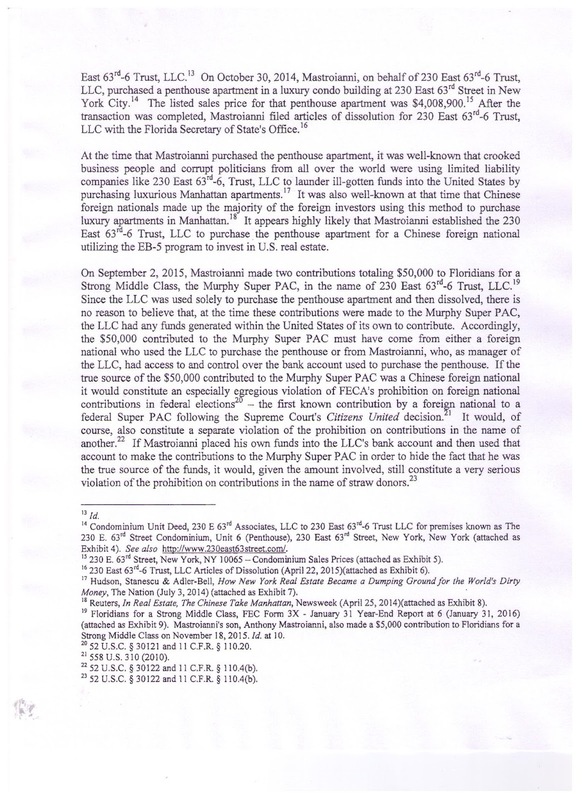 But more importantly in this case, Chinese nationals cannot legally make contributions in federal races. In return for these donations to his campaign and his Super PAC, Murphy co-sponsored legislation for Mastroianni’s benefit. Namely, Murphy used his elected office to try to expand the EB-5 program and make it permanent. 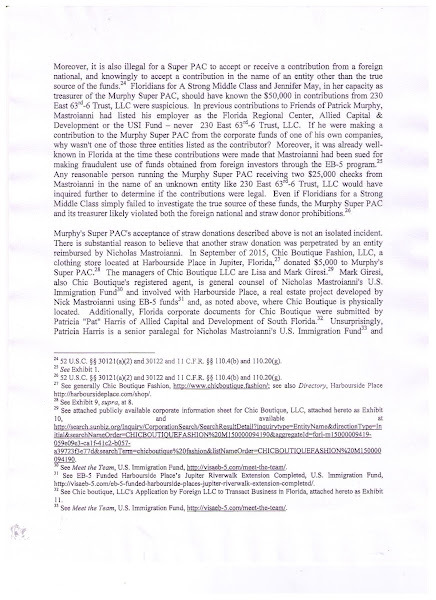 In return, Mastroianni has used LLC’s, businesses, family and associates to move money to Murphy, his EB-5 do boy. 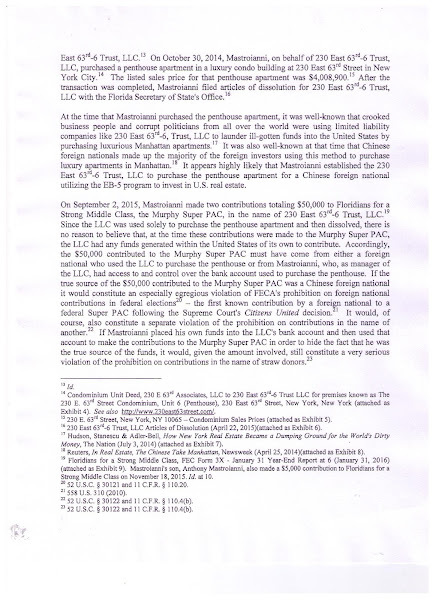 As the complaint lays out [and I've included the documents I submitted to the Office of Congressional Ethics], it appears that Mastroianni used a Manhattan luxury condo and a shady LLC linked to it, to possibly funnel Chinese national money on to Murphy’s Super PAC. Murphy’s family has been linked to dodgy campaign fundraising schemes in the past, including playing a key role in Ami Bera’s father being convicted of campaign finance fraud. But Murphy’s EB-5 antics are just too much. If investigators take these allegations seriously, it could prove to be a great federal test case for whether shell companies can be used to fund SuperPACS. 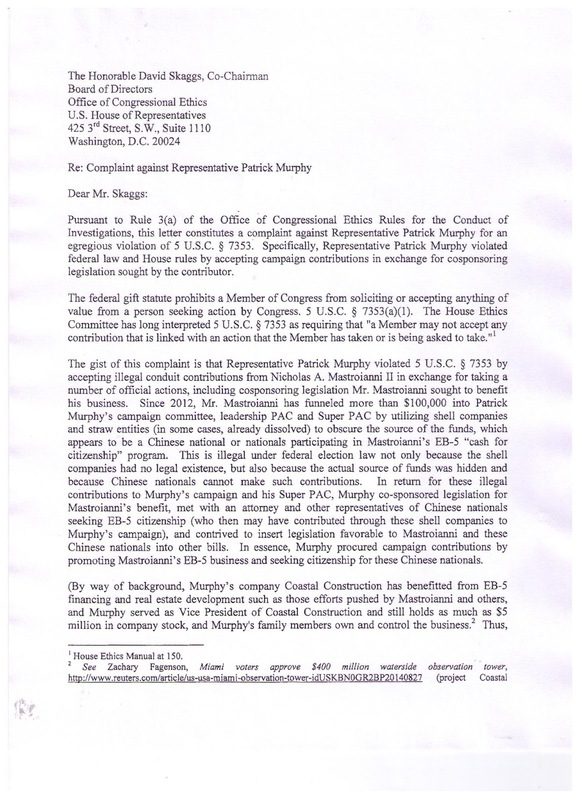 But hopefully these complaints will also draw attention to the shady fundraising that Murphy and his SuperPAC are engaging in, which appears to be directly tied to his official efforts to expand and make the EB-5 program permanent. Murphy also played down questions about his support for the EB-5 visa program. His campaigns have received contributions from Florida developers who tap into the funding source. Foreigners who invest at least $500,000 are given green cards; many participants are from China. The program has enjoyed broad support but also come under scrutiny for fraud and a perception it sends the wrong message about the country's immigration system. Nicholas A. Mastroianni II, a major EB-5 player based in Florida, has along with family members given Murphy about $25,000 and he has used companies to give at least $50,000 to the pro-Murphy super PAC. Another EB-5 developer and Murphy donor is Jeffrey Berkowitz, who is developing SkyRise Miami, a $430 million entertainment and observation tower. Coastal Construction was a partner in that project but no longer is, according to Murphy campaign spokesman Joshua Karp. Company officials could not be reached. A registered lobbyist for SkyRise, Brian May, is part of the team working for the super PAC, records show. Murphy said Mastroianni and Berkowitz are friends and he gives them regular updates on the campaign. 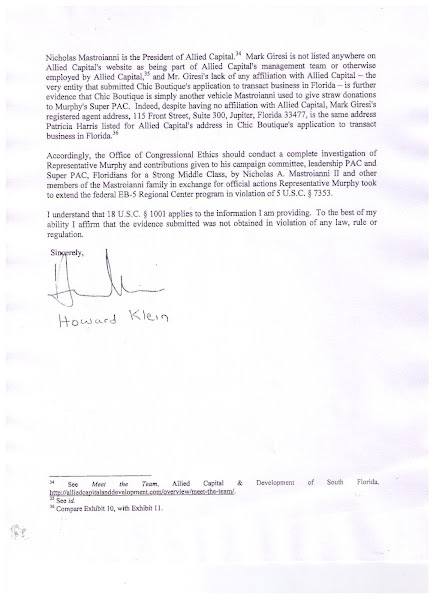 But he said he did not recall specific conversations with them about legislation he sponsored in 2014 to make the EB-5 program permanent. 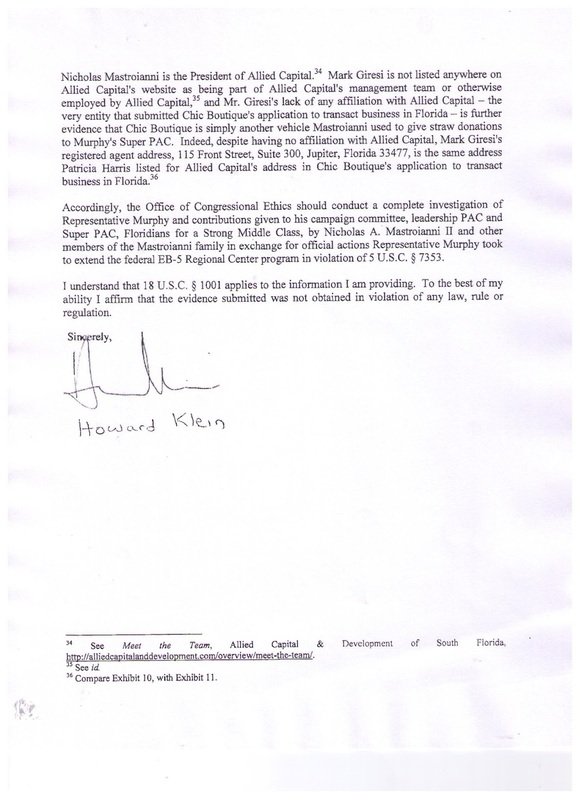 He also did not recall meeting with Liu Yu, a New York based lawyer who specializes in the field. The two appeared in a 2014 article on a Chinese-language website. Murphy said the EB-5 program has enjoyed bipartisan support and that it brings investment and creates jobs. ‘I'm a member of Congress and I'm not actively involved in the family business... so feel free to reach out to them and learn more about what they do,’ he told reporters on a conference call his campaign arranged last month to blast Grayson over alleged ethics issues. ‘But as far as I know, they have not done any projects to do with EB-5.’ In February, Coastal, in a partnership with Tishman Construction, was named general contractor for the Miami Worldcenter, a $1.7 billion shopping, entertainment and housing project planned for 27 acres in the city's downtown. Financing will come in part from EB-5 investors. 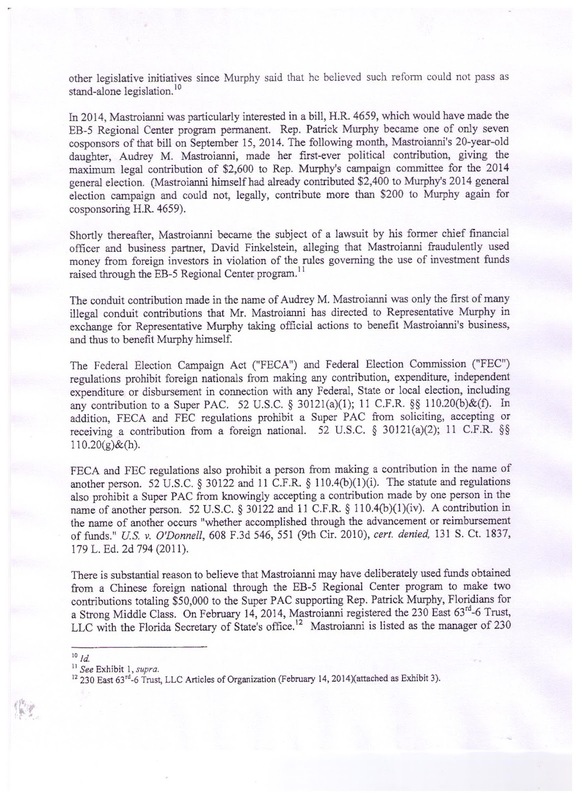 Project developers and family have given Patrick Murphy more than $30,000 plus $25,000 to the super PAC. Murphy's campaign said Friday it was unaware Coastal was involved in the project.